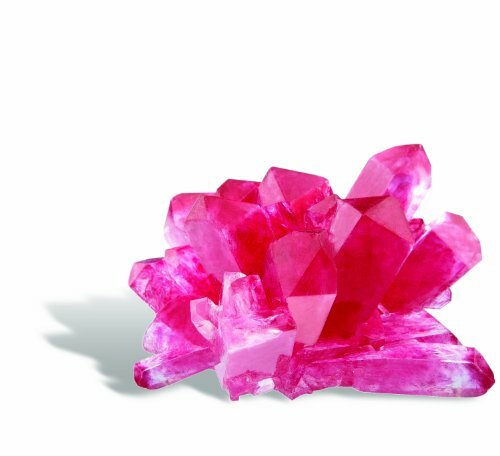 Grow lovely crystals in red, clear, or blue. Not really educational, this kit is more about making pretty decorations. Colorful crystals make a lovely display and a fun afternoon activity for the whole family. The directions are very specific, though, so please be sure to follow them to a T. Lacking the educational value of a similar kit made by Thames and Kosmos, this product is really about growing crystals. Even though some crystals may not come out as expected, this kit still has a much higher success rather than other kits we’ve seen. Users tend to be happy with their crystalline results. Delicate and colorful, the crystals look good just sitting on a windowsill, but also work as bases for a dried flower or insect to be glued to. Requiring boiling water, this process may need adults to step in and help out younger kids. Make a number of beautifully colored crystals! The blue, red, and white seed powder can be mixed to achieve crystals that are red, pink, purple, blue, light blue, or clear. 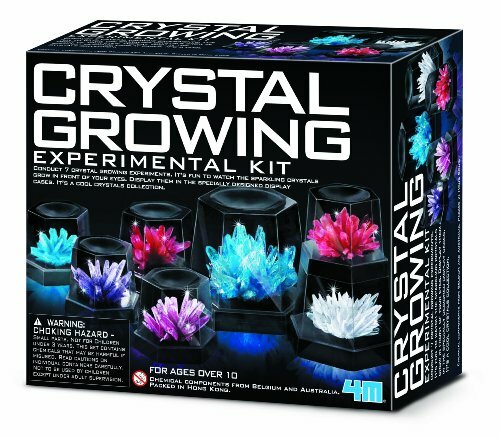 The kit contains 3 bags of crystal growing medium. 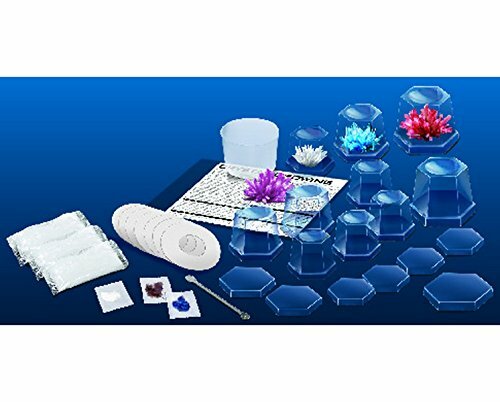 Each bag can produce either 1 large crystal OR 2 medium crystals OR 4 small crystals. There is only one large sized container, so growing three large crystals all at once will require finding additional containers. Glass jars work well, so long as you can get the crystal out once grown. Red, clear (white), and blue seed starter is also included, along with a spoon for stirring and measuring, an instruction sheet, and seven growing containers: one large, two medium, and four small. Boil, mix, stir, wait. Crystal growth is usually noticeable only a few hours after the solution is mixed, with decent growth happening overnight. Crystals may be fully grow as quickly as three or four days, but some conditions, such as cooler temperatures and high humidity, may slow the growth time to two weeks. As with many home-science kits, getting the best results requires patience and attention to the directions. That said, most users are very happy with their crystals, and often make additional purchases. The finished crystals will be fragile. Meant for display, they are in no way suitable for jewelry making, or frequent handling, and will break to pieces if they fall off a shelf. They are lovely, and look nice sitting on a dresser or windowsill. We noticed a difference in the red and blue crystal shapes. The red is blockier while the blue is more sharply pointed. Mixing red and blue gets a purple crystal that is shaped somewhere in between blocky and pointed. White crystals seem a bit more delicate, but still lovely. In order to grow the best crystals, the instructions must be followed carefully. Using water that is too cool, or not giving enough time for the initial crystal solution to cool before adding the seeding powder can result in subpar results. Make sure to wait 30 minutes before adding the seed powder. Even with that said, we have had reports of some crystals just not growing well. This could be due to a number of factors, other than misunderstanding the directions, such as water quality, temperature and humidity levels of the home, and if the solution is disturbed during the growth. The growing solution should be left in a warm but dry place. Homes that are more humid, or too cool may have trouble getting the crystals they want. The top of the fridge works well to let the solution sit, as it is often both dry and warm. However, if the fridge is not very steady, and wiggles or shakes when the door is opened and closed, then a windowsill may be a better spot. Disturbing the solution as it grows is worse than having it rest in a place that is not optimal temperature or humidity. The crystal grows because the particles participate, or settle, out of the supersaturated solution. Make sure filtered or distilled water is being used, especially in areas where the tap water is very hard. Additional sediment in the water can alter the growth of the crystal, and create disappointing results. Because of this, we suggest using water boiled in a pot. Using water boiled in a kettle can end up having more sediment than normal from any limestone crust that has formed inside the kettle over time. 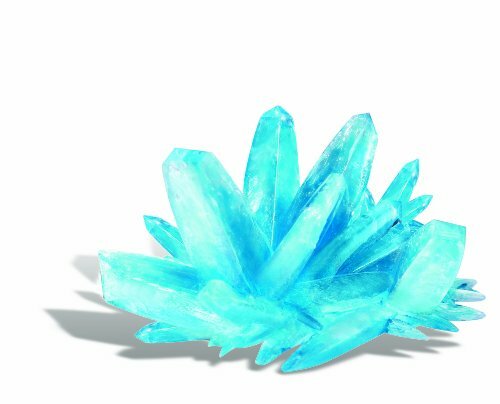 We have read reports of some users finding that their crystal starts growing up and over the sides of the growing container. When this happens, crystals may also start to form on whatever the container was sitting on, and may continue to spread up nearby walls or over other objects. As exciting as this sounds, this can end up leaving a permanent stain on some surfaces. We recommend laying down a layer of newspaper or something underneath the growing container, just in case. It is normal and perfectly fine for small crystal pieces to grow inside the container above the water line. Do not try to fleck these pieces back into the solution. This will disturb the solution, and can destroy whatever growth is happening. It is also normal to have some gooey looking material settle on the bottom after the seeding powder has been added. This may mean the crystal takes longer to form, possibly more than two weeks. DO NOT STIR THE GOO! Disturbing the growing solution can easily destroy any chance of having a nice looking crystal form. The goo is fine. Let it be. The manufacturer recommends this kit for ages 10 and up. We think younger children will enjoy the process just as much, though the idea of not touching the growing container for days on end may be a little difficult for them. As this requires boiling water, adult supervision should be given for children inexperienced with such tasks. Children who know how to cook and follow baking instructions will likely be able to do this project without adult help. Since following the instructions to the letter is vital, we recommend reading them before starting the mixing process. Some users have reported problems keeping their display cases closed. We did not find trouble closing them, but did feel that the crystal would be more secure if glued in place. Hot glue, super glue, Gorilla glue, and any other craft glue should work fine. Everything needed is included in the kit. Please follow the directions carefully. Failing to do so can easily result in little or no crystal growth. 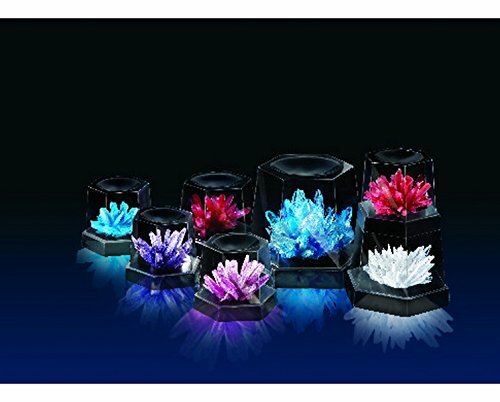 Grow your colourful crystals in the container provided. It’s a fun and sparkling chemistry experiment. Children are not particularly tidy creatures. Our Cleaning Guide will tell you how to clean plastic figures, battery operated robots, metal cars, and toys made of wood.